Bill Geissele exploded onto the AR scene in 2004 when he started building National Match triggers. It wasn't long before certain units in the US military took notice of his talent and, today, Geissele is synonymous with reliability. Few small companies garner the respect Geissele Automatics has earned with its line of bombproof triggers. Today though, Geissele Automatics does much more than just triggers. 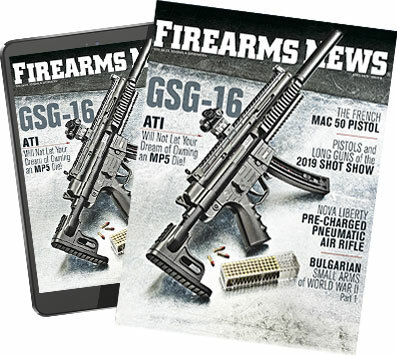 A rock star to AR aficionados, Bill Geissele has slowly but steadily expanded his operation. Now he offers an array of triggers, handguards, gas blocks, armorers tools and more. "Like many of Geissele's products, the Super Precision mounts started with the DoD and a specific request. I didn't develop these in a vacuum, but I put together the design specification from what I was told, and the things lacking in other scope mounts that are on the market." What was needed was a mount that was very stiff and did not use the scope as a structural member, was very accurately machined and had true ring bores, had a specific way of clamping to the upper receiver Picatinny (using the vees, not the loosely toleranced top as a datum), included integral shear lugs that had a close fit to the slots in the upper receiver, had a quick detach and high-quality levers that wouldn't come loose, had a proper fit to the scopes that the mount is used for (no rings jammed up against the turrets or objective) and the best possible return to zero that can be achieved. Using 5-axis machining, lightening pockets are generously used so that the structure of the mount is much stiffer than a mount with thin sections. A full length rib is used between the rings and also one coming off the back ring. No spindly flexible flyer extensions. The cross bolts are spread out, not close together. The entire mount is machined from a 4.6 pound block of billet 7075-T651 aluminum, the rings are 'line bored' one to the other (no separate caps), exactly true to the bottom Picatinny interface. The caps are then finely cut from the bottom ring with a 0.015" jeweler's saw and each cap serialized to its corresponding ring base (each mount has its own unique serial number). Use of the U.S. military method by clamping to the vees, not the less accurate and secure 'NATO' way. Both clamp screws are machined with flats to act as shear lugs and with a low height to the slot, there are also two integral machined in shear lugs that are a close fit to the receiver. Almost no movement backwards and forwards. This is the right way to set up for a semi-automatic weapon with recoil and counter recoil forces. Geissele's customer leaves the mount on the weapon and does not have a need to flip back and forth between guns and deal with the corresponding re-zero. Also, they now jump with the optic on the gun instead of removed so there is no need to install after insertion. The cross-bolts clamp the mount to the upper with over 1,400 pounds of force for each bolt. No lever system can compare to this kind of secure attachment. The mount (seen here) was designed specifically to fit the Vortex 1-6x24. The rings are right in the center of the gap between turret and eyepiece when the scope is at the correct eye relief. Because we machine out of a solid block we have the ability to put the rings and cross bolts where ever we want. There are no constraints. That does not mean it won't fit other scopes. It's just made perfectly for the Vortex. Cross-bolts that are spread out, full angle contact on the clamp wedges (not partial on the top angle), U.S. Mil Picatinny interface, good shear lugs, stiff mount so that the scope is no longer loaded structurally, or the scope is what keeps the mount together, high clamp loads and ultra-tight tolerances give the Super Precision excellent return to zero with NO torquing values needed for the clamp nuts. Just tighten by hand with a Leatherman screwdriver or ½-inch wrench and go. RTZ has been reported with just hand tightened nuts, even loose nuts and the scope and mount held on by the spotter. At launch in January, Geissele plans to have three different types of 30mm mounts, four types of 34mm, black anodize and the DDC shown in the picture, 0 MOA, 20 MOA versions and mounts for the Aimpoint T1/T2, Trijicon MRO and others. There are also two aluminum alloys available: 7055 Aluminum, which is a stronger 7075, and also Alcoa's 2099 advanced Lithium/Aluminum alloy which is as strong as 7075 but lighter, stiffer and more corrosion resistant. 2099 is used in highly loaded airframes by Boeing and Airbus and is considered the cutting edge of aluminum alloy development. Mount cost is around $350. My take on it? I had the opportunity to examine and put Geissele's new mount to work at Big 3 East. As to be expected, it is a handsome piece which is beautifully made. Every detail is carefully thought out and well-executed. The finish and markings were both flawless and added to the character of this piece. It interfaced flawlessly onto an AR rifle and performed without issue during three days of high volume shooting. Is it expensive? Very. But if you can afford it and like to own the best, then you'll to look into this mount when they are released at SHOT Show in 2016. If you want to know more, keep your eye on Geissele's website.